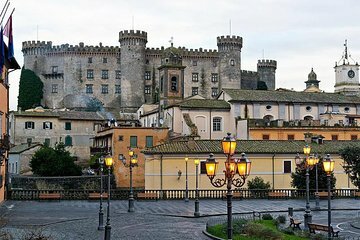 Goditi il ​​tempo lontano dalle affollate strade di Roma con un tour di un'intera giornata al Castello di Bracciano. Il trasporto confortevole ti porta dalla città al castello. Dopo aver saltato la linea del biglietto, goditi una visita guidata all'interno del parco. Più tardi, visita la cantina laziale in un castello del 13 ° secolo. Dopo un tour del vigneto, assaggiate una varietà di vini di produzione locale e un famoso piatto di pasta. This turned out to be a private tour just for the four of us. They practically rolled out the red carpet for us. What an awesome tour this turned out to be. Way beyond our expectations. The castle blew us away - wow!!! The wine tasting experience along with the fantastic meal they served us was very memorable. You have to do this and get out to see the roman countryside. You will not be sorry. Highly recommend. My wife and two teenagers took this tour a week ago when we were in Rome. It was a great change / distraction from the hectic pace of Rome and it's beauties. We met our driver Andrea at Piazza del Popolo, he was very friendly and courteous. We drove to Bracciano Castle and took a short but complete tour of the castle with great views overlooking the lake. We then drove to a local winery for a great lunch which included 3 different wines for tasting. The lunch was really good, all done with local ingredients, great tiramisu. We then drove back to Rome. Having done some similar tours in the past in other countries ex: Portugal, I think it would have been great to have more interaction with Andrea and get his perspectives, maybe even join us for lunch.